Here is today's Tile of the Week entry plus some information on a few new PBE Games releases. 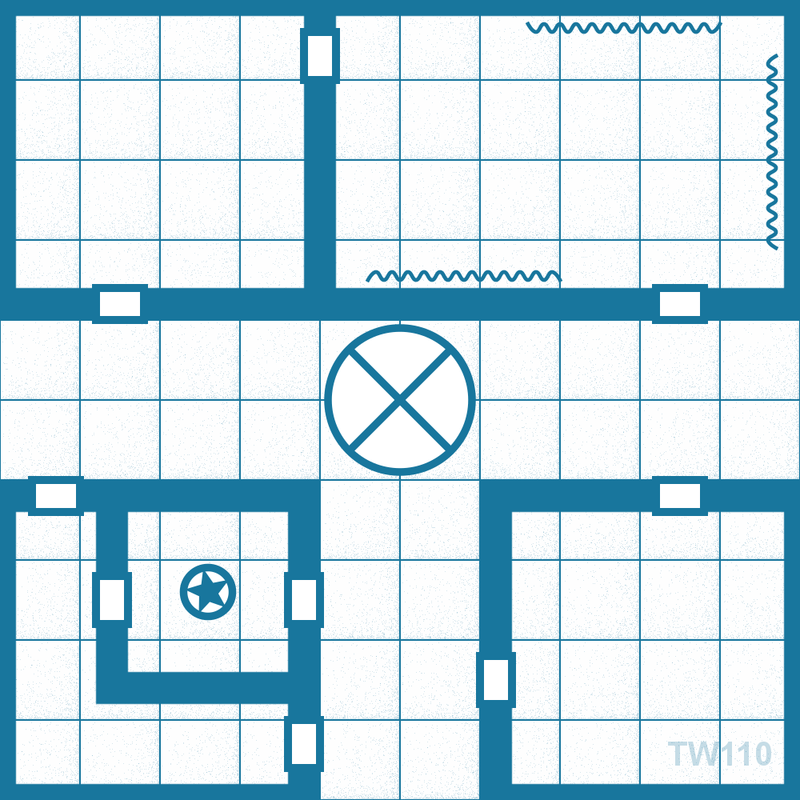 This tile is a half-size sewer geomorph with several connected rooms and corridors. 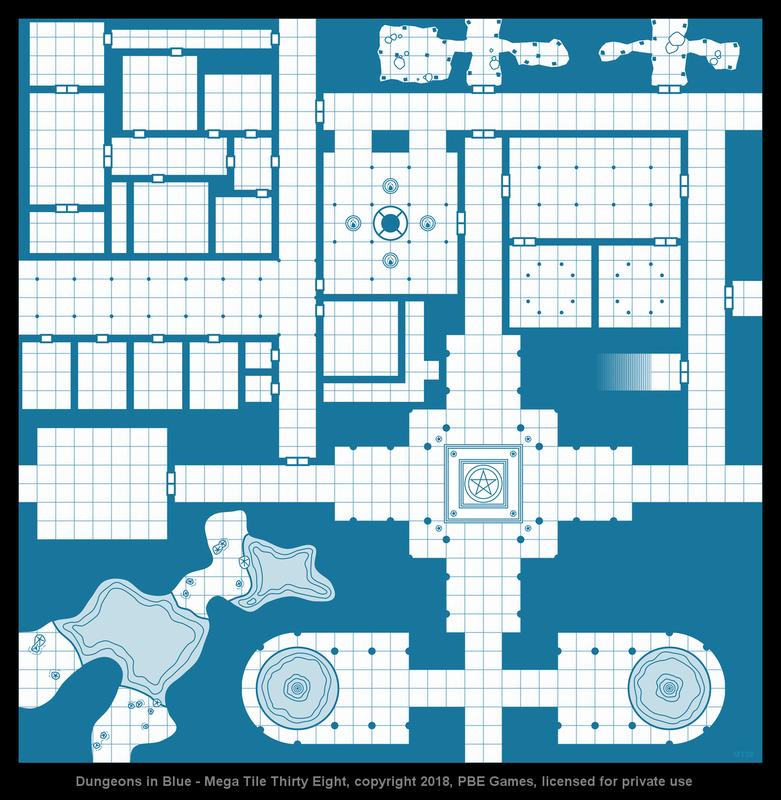 All Tile of the Week images are free for private use. You can download the images above using right-click/save as. 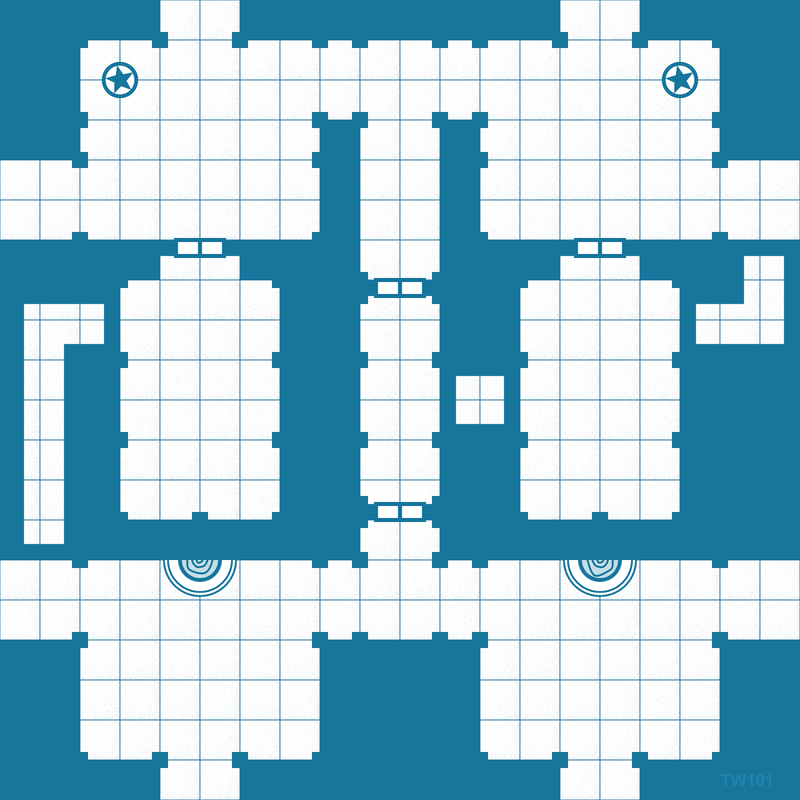 Each tile is a 100px per five-foot square image, sized for compatibility with Dungeons in Blue geomorphs. 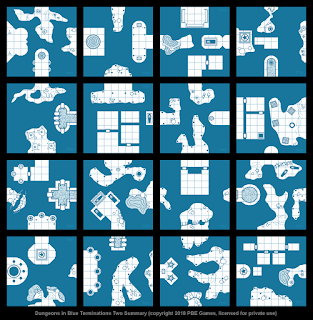 The entire Tile of the Week Collection is also available as a pay what you want bundle if you're feeling lazy, and I'll be updating this soonish to include the last eight or ten tiles posted here. I've also published a handful (a big handful, actually) of new Mega Tiles and Complexes. For those unfamiliar, Mega Tiles are single quad-size tiles that are compatible with other Dungeons in Blue geomorphs. 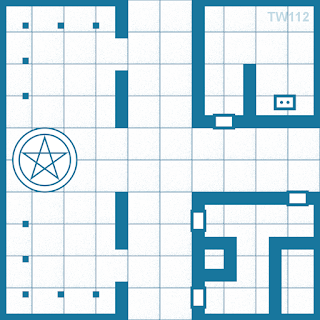 Complexes are dual-purpose, quad-size tiles. 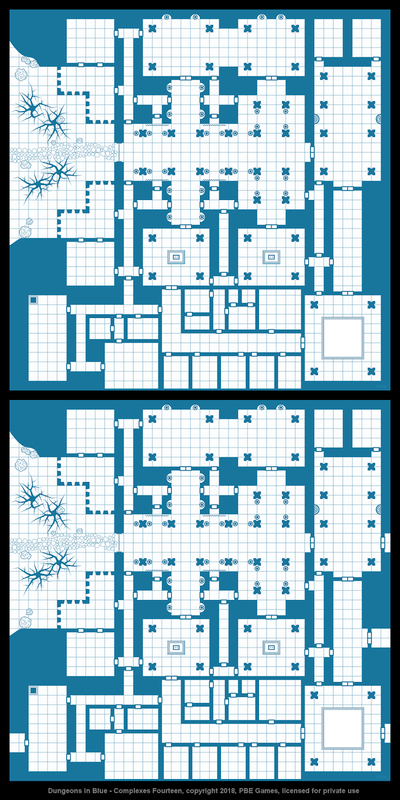 They include both a standalone version you can use as a one-shot dungeon and a geomorph-ready version you can add to a larger creation. Complexes #13 shows a system of large caves that contain a small lake. The area is only reachable via holes in the ceiling. 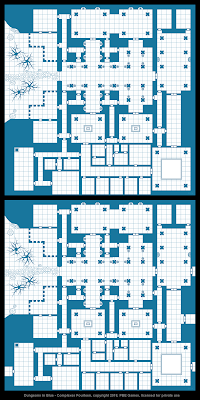 Complexes #14 depicts a traditional dungeon with large, pillar-filled halls and chambers, two shrines, and a room with a huge, empty dais in the center. Complexes #15 shows a large chasm or tunnel with two outdoor entrances. 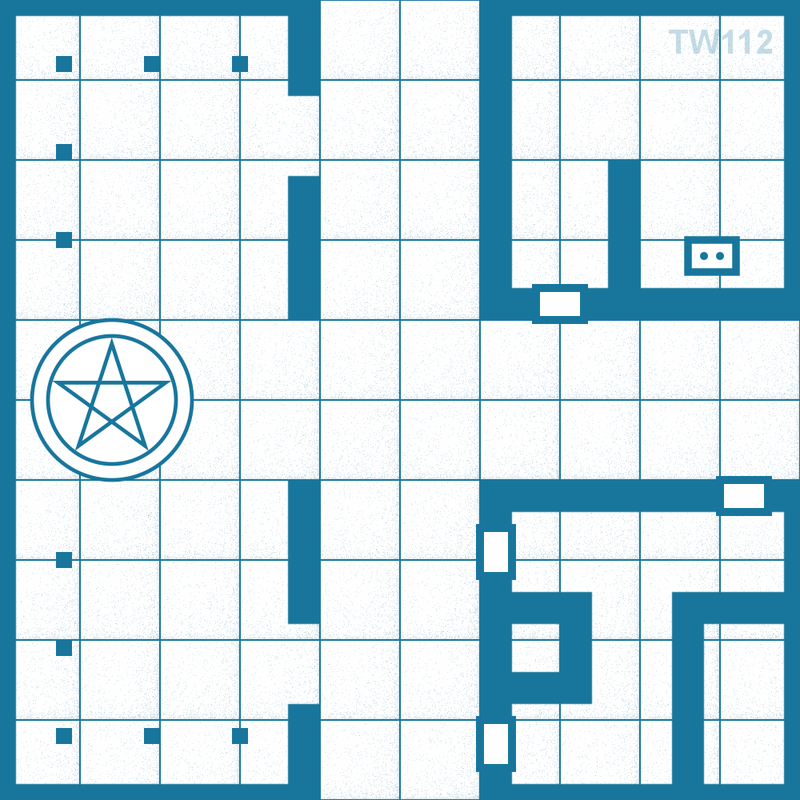 Various rooms and tunnels are carved into its sides. Complexes Triple Pack #5 is a discount bundle containing all three of these products. 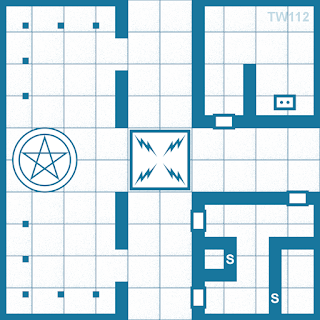 Mega Tile #36 depicts an enormous underground chamber surrounded by smaller rooms and four shrines. Mega Tile #37 is a cave complex with many statues scattered throughout. 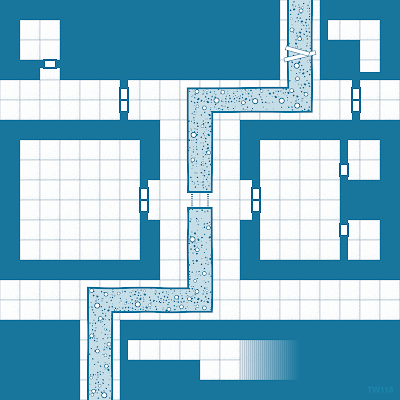 An underground river, crossed by a bridge, cuts across one corner. 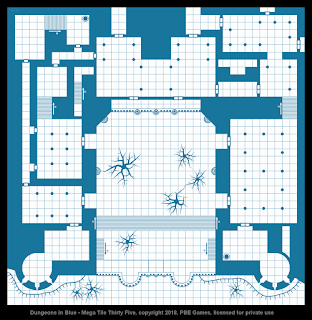 Mega Tile #38 features a traditional dungeon complex with several prominent features and new construction along one side. 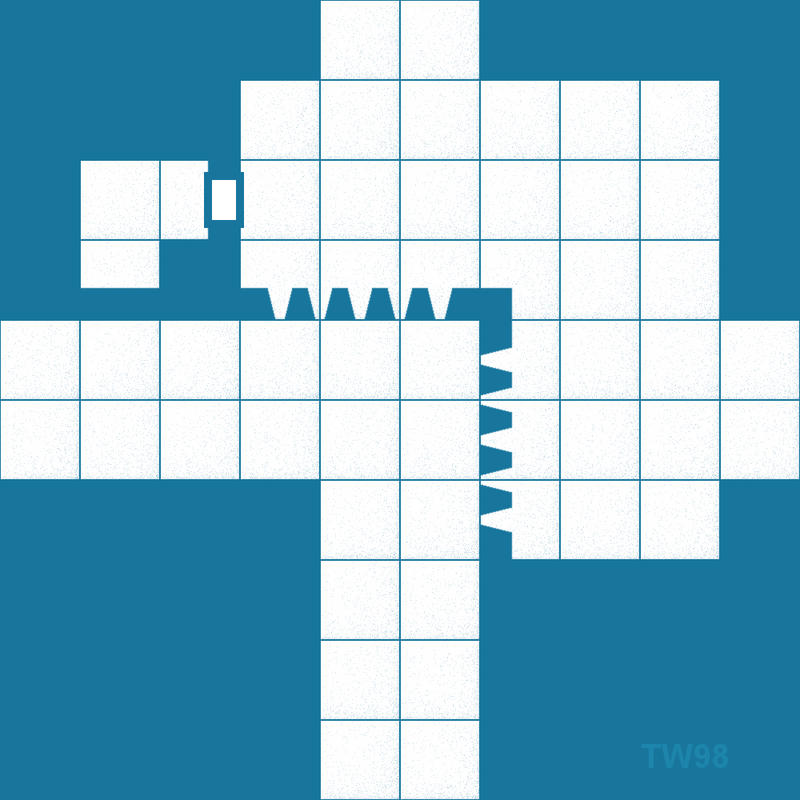 Mega Tile #39 shows a cavern complex divided by a cliff face. Traditional dungeon corridors and rooms fill one corner of the geomorph. Mega Tile #40 shows a single huge chamber containing many smaller rooms. 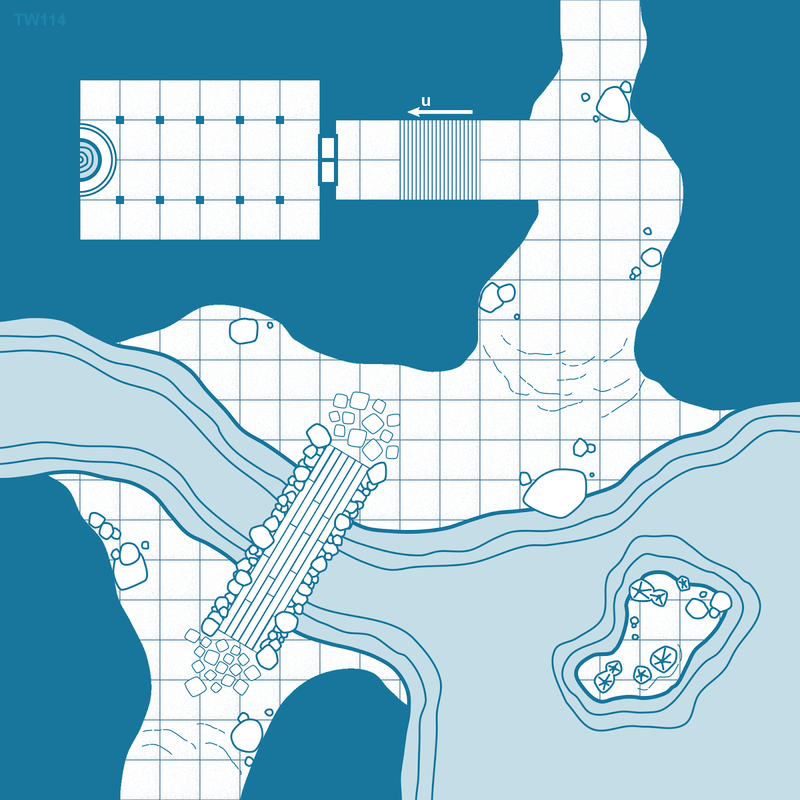 A river featuring docks and bridges divides the space. Mega Tile Five Pack #8 bundles all five new Mega Tiles into a single package at a discounted price. Mega Tile Big Deal #2 offers a larger discount on Mega Tiles 21 to 40. With that, I believe I'm caught up with new releases. Thanks for reading and happy gaming! 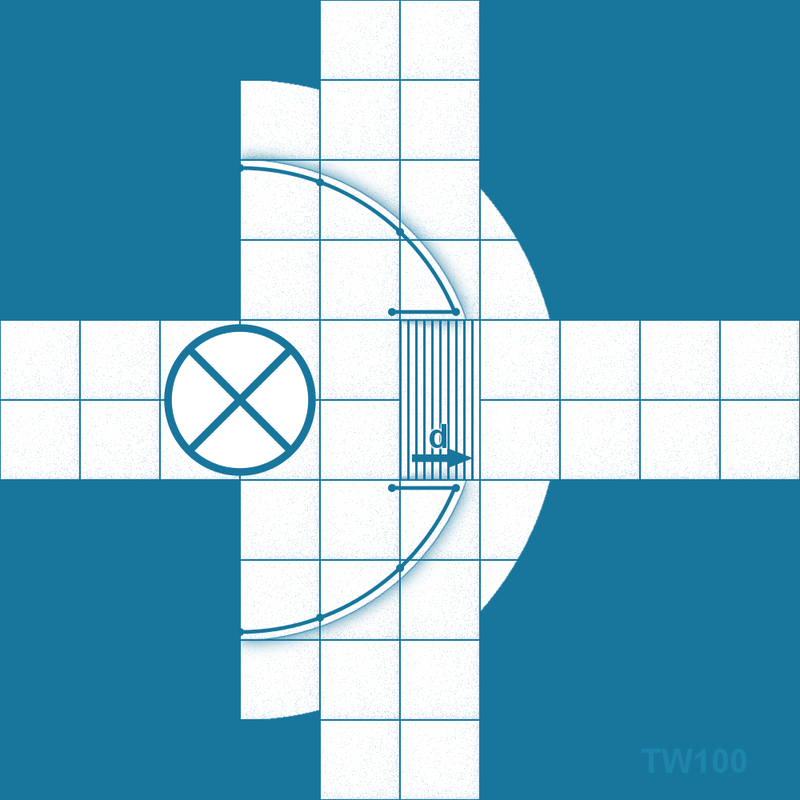 Here is today's Tile of the Week entry. 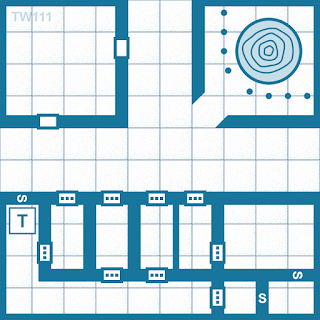 It's a full-size tile that shows a section of sewer tunnel with several connected rooms and corridor nearby. 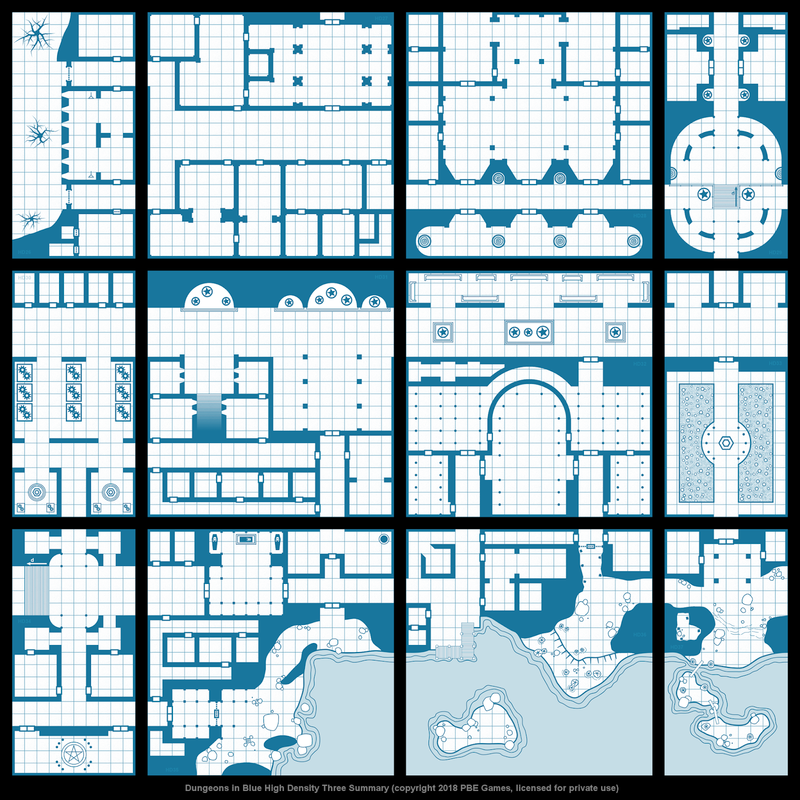 All Tile of the Week images are free for private use. You can download the images above using right-click/save as. 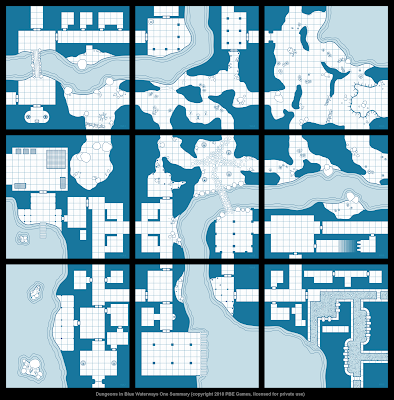 Each tile is a 100px per five-foot square image, sized for compatibility with Dungeons in Blue geomorphs. The entire Tile of the Week Collection is also available as a pay what you want bundle if you're feeling lazy. 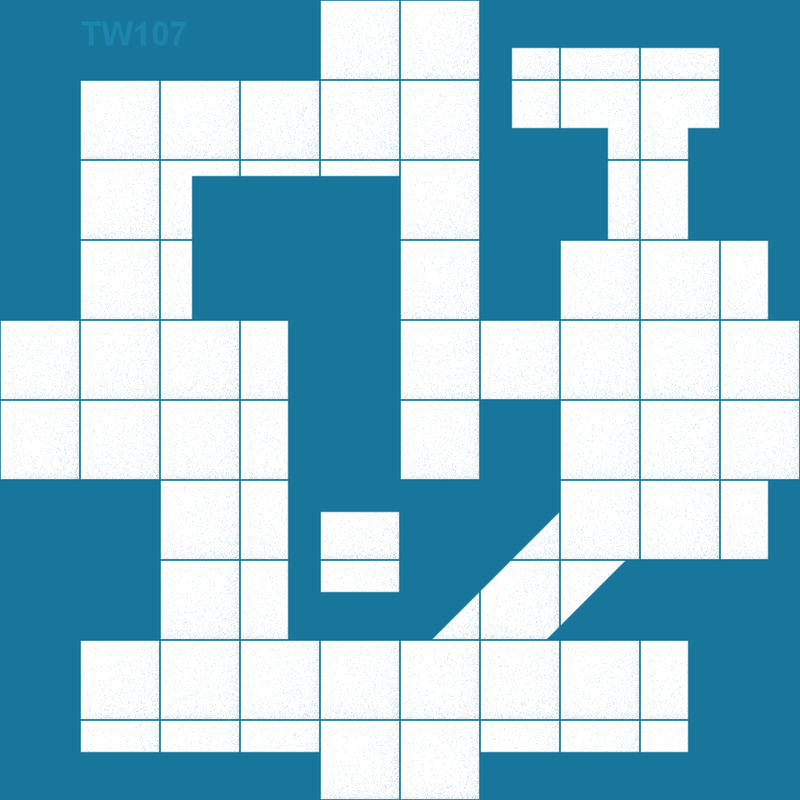 I haven't done a Tile of the Week entry in a while, so... here you go. 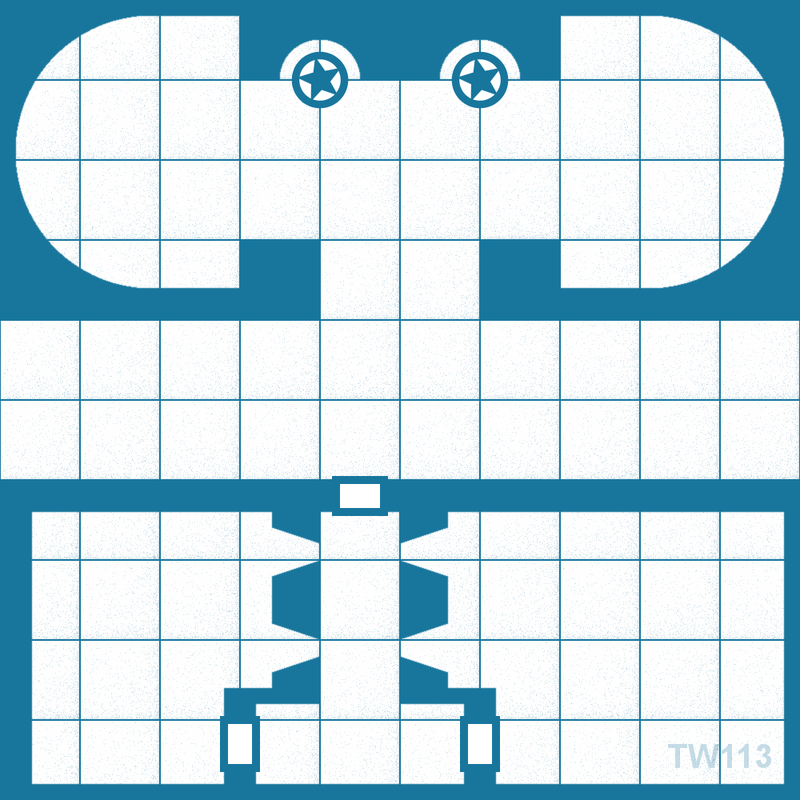 This is a standard-size geomorph that depicts an underground river that feeds a lake. Someone or something has built a bridge over the river and carved out a chamber nearby. Underground rivers and lakes are also the theme of the recently released Dungeons in Blue - Waterways Pack, which contains 27 full-size geomorphs, each with a water feature. You can see a preview of one of the included tile sets at the end of this post. 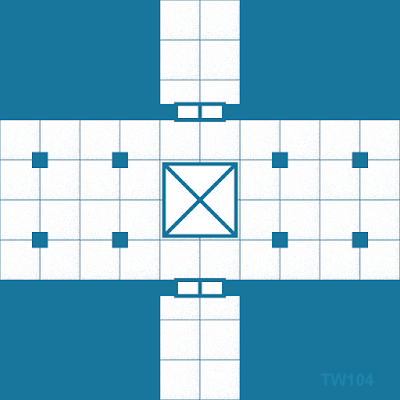 Here is today's Tile of the Week entry. This is the fourth of four tiles that use a high-density room/corridor style. I have a full set of similar tiles in the pipeline. 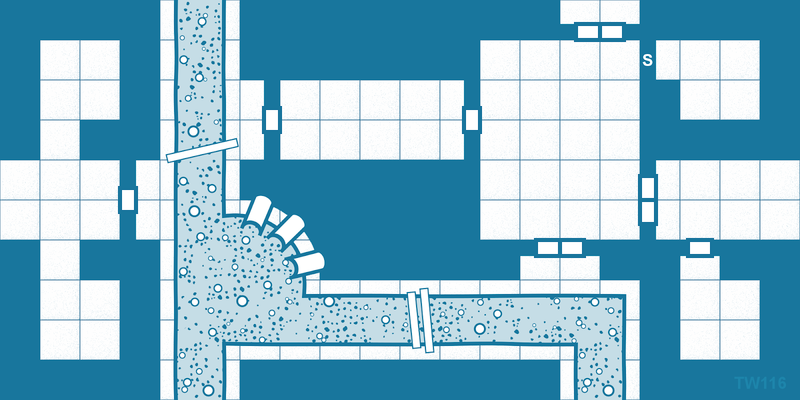 And here's a preview of one of the upcoming High Density geomorph sets. 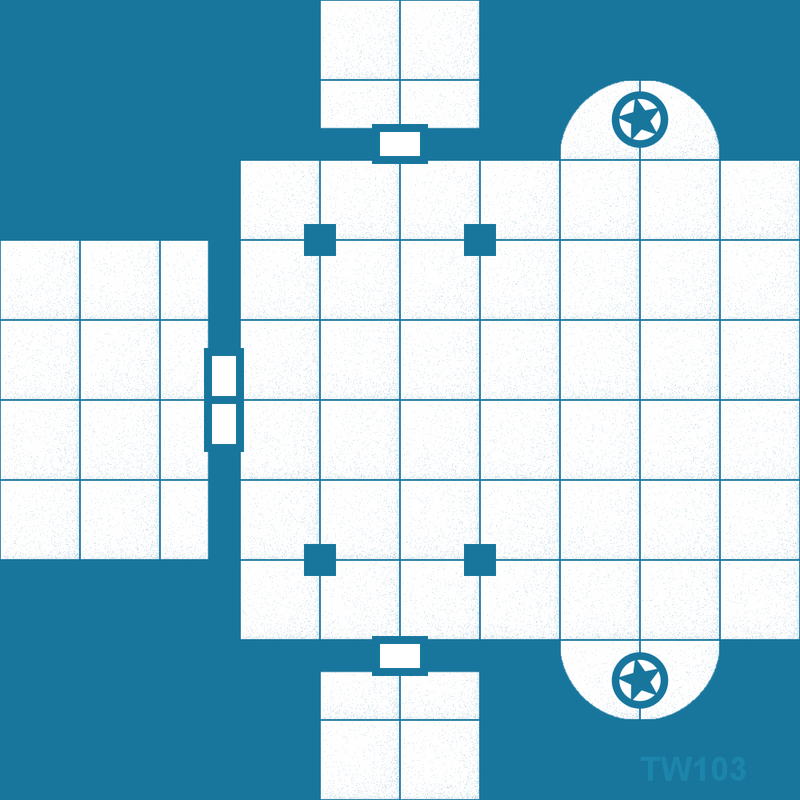 Here is today's Tile of the Week entry. 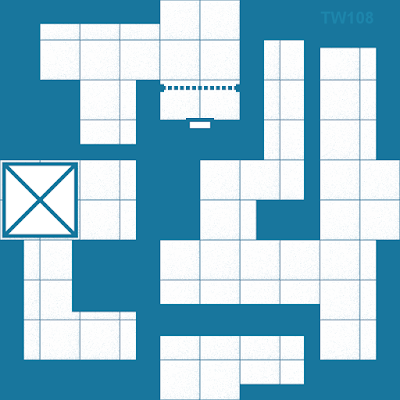 This is the third of four tiles that use a high-density room/corridor style. I have a full set of similar tiles in the pipeline. 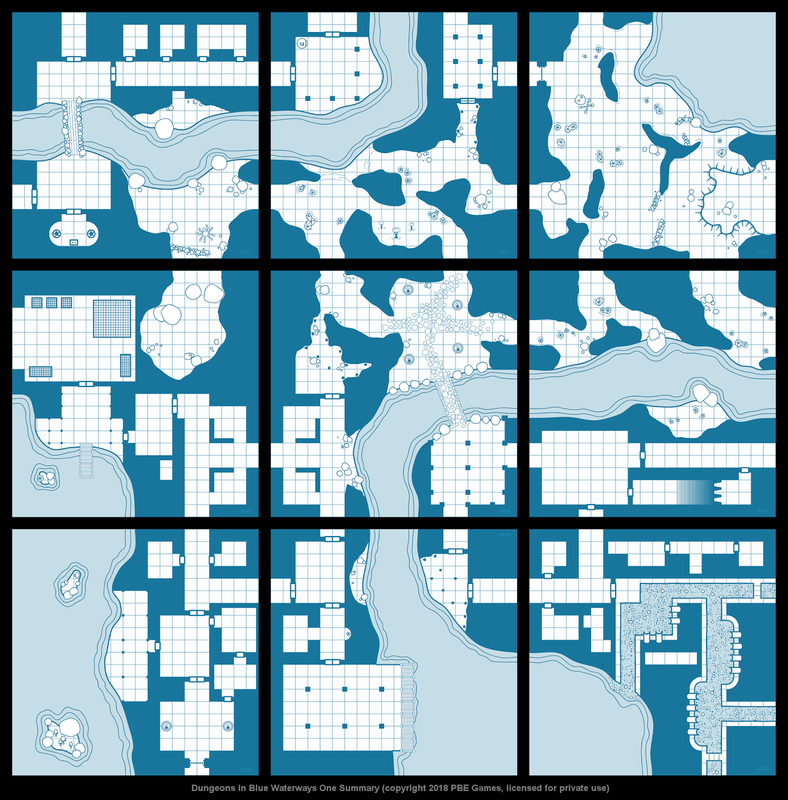 Here is another Tile of the Week entry. 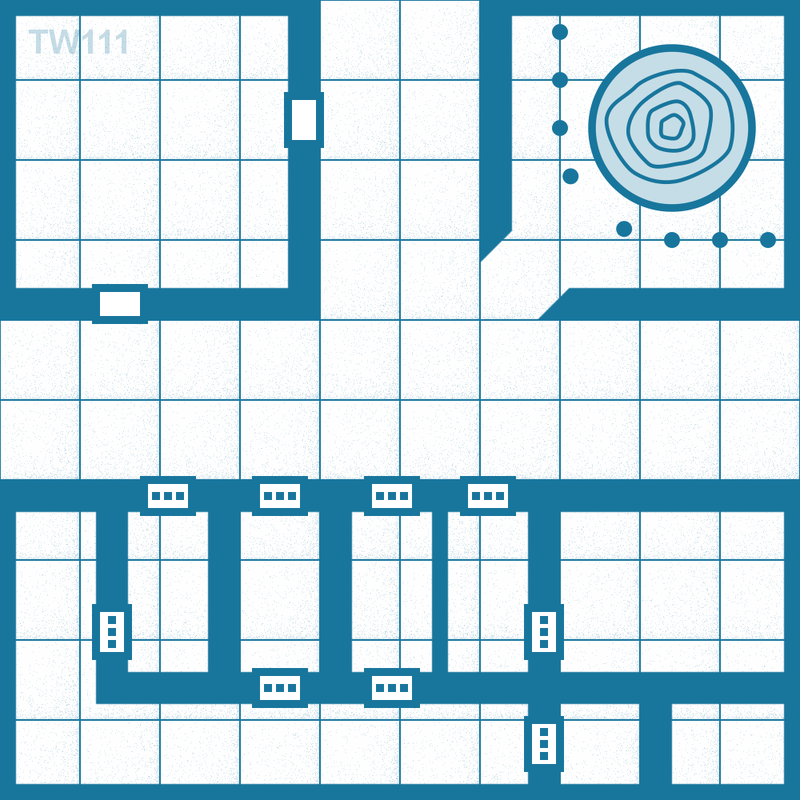 This is the second of four tiles that use a high-density room/corridor style. 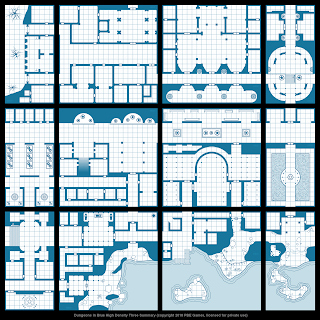 I have a full set of similar tiles in the pipeline. 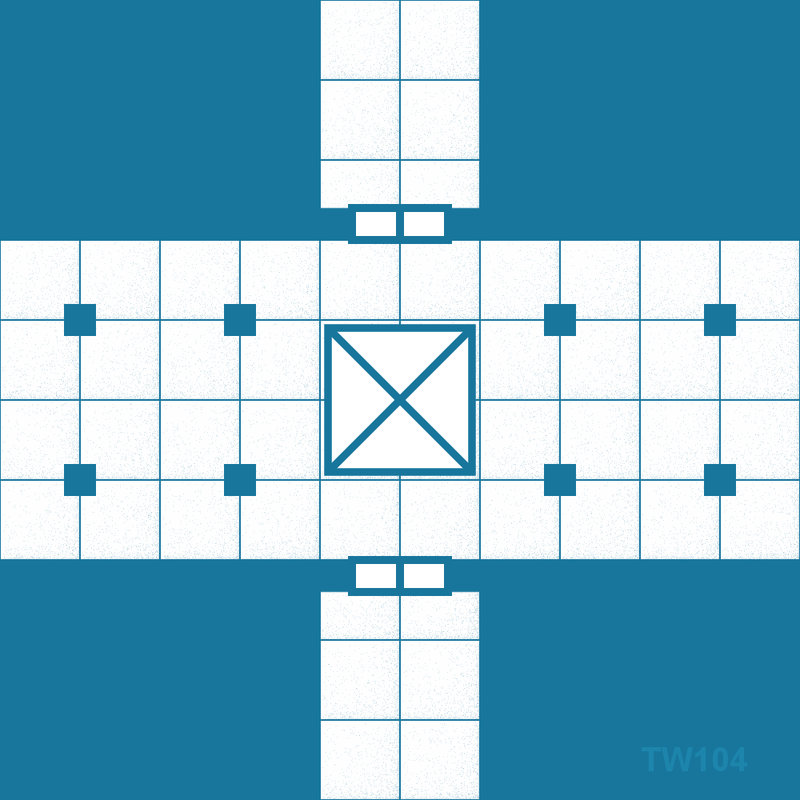 Here is today's Tile of the Week entry. 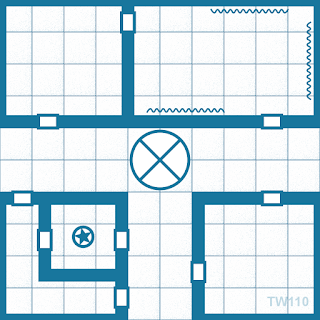 This is the first of four tiles that use a high-density room/corridor style. 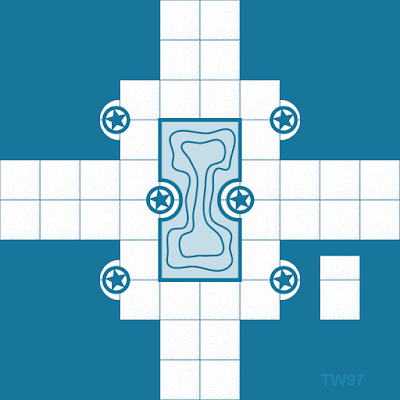 I have a full set of similar tiles in the pipeline. 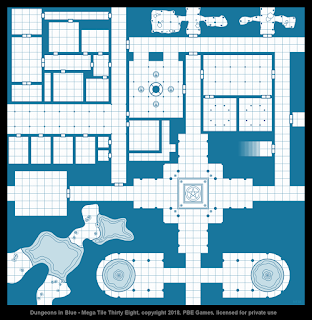 And since we're talking about Dungeons in Blue, I'll touch on a few new products that are now available. Terminations Two - A set of 16 quarter-sized tiles, each with three or more dead ends. 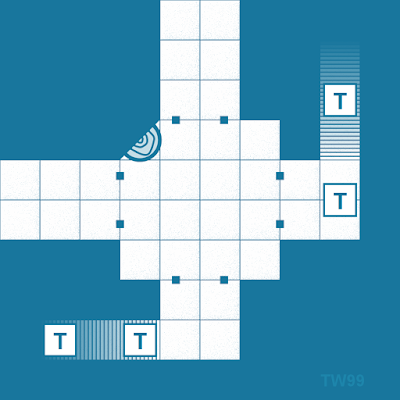 Using these tiles, you can bring a variety of corridor styles to a finished-looking end. Odds and Ends - A discount bundle that includes six sets of geomorphs: Transitions Two, Border Bits, Labyrinths, Entries and Exits Revisited, Terminations, and Terminations Two. 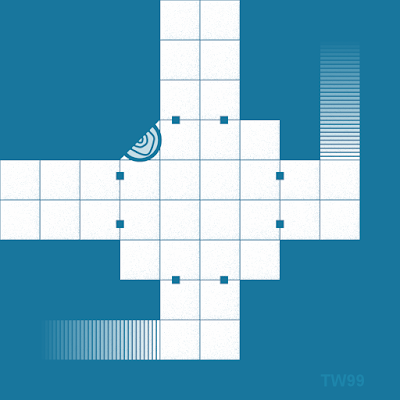 Mega Tile Five Pack #7 - Another discount bundle that includes the five most recent Mega Tiles (numbers 31 to 35). Individual tiles are also available separately, of course. Here is a pair of previews of the items above. Here is today's Tile of the Week entry. 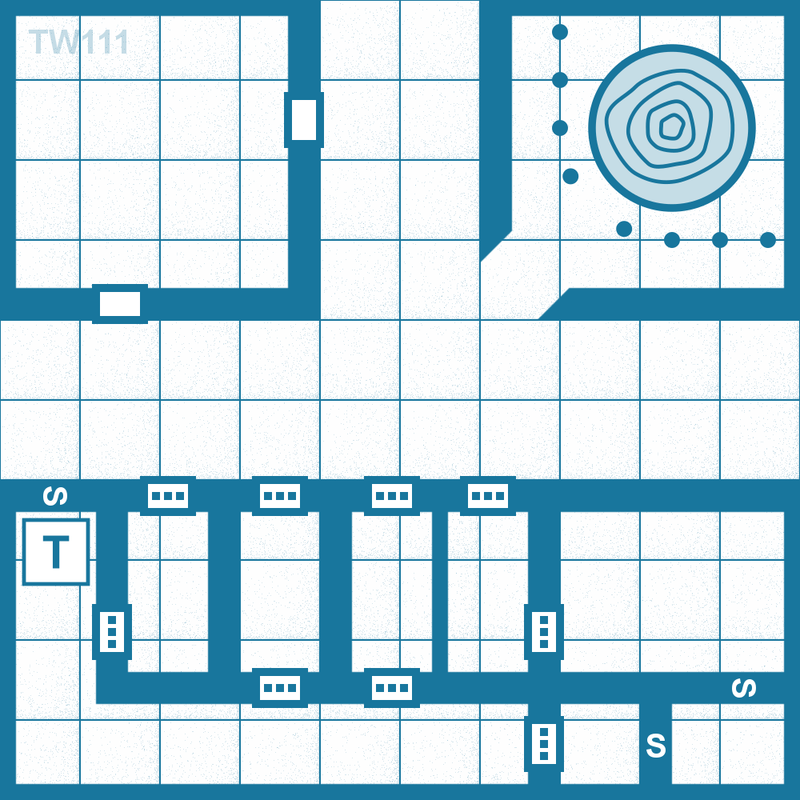 It's the last of four labyrinthian, quarter-sized tiles like those in the upcoming Labyrinths set for Dungeons in Blue. Here is today's Tile of the Week entry. 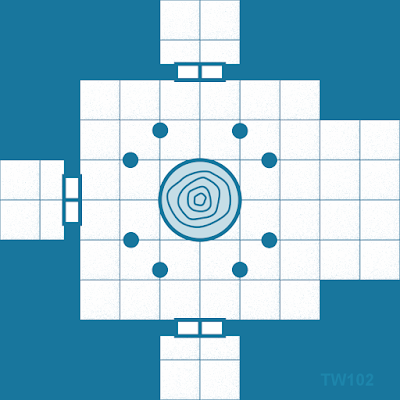 It's the third of four labyrinthian, quarter-sized tiles like those in the upcoming Labyrinths set for Dungeons in Blue. Here is today's Tile of the Week entry. It's the second of four labyrinthian, quarter-sized tiles like those in the upcoming Labyrinths set for Dungeons in Blue. Here is today's Tile of the Week entry. It's the first of four labyrinthian, quarter-sized tiles like those in the upcoming Labyrinths set for Dungeons in Blue. Here is today's Tile of the Week entry, the fourth in a series of quarter-size tiles depicting intersections that include mixed corridor widths. Here is today's Tile of the Week entry, a quarter-sized tile with a 20-foot wide corridor and two connecting 10-foot wide side passages. Here is today's Tile of the Week entry. This is another quarter-sized, four-way crossing that brings together several passages of different sizes. I've been working on some new Dungeons in Blue Expansion Sets recently, and I decided to put together a few small transitional tiles and release them here. 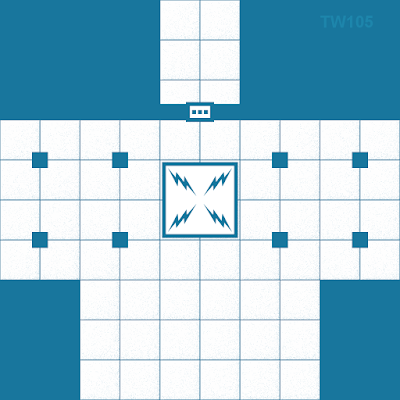 Today's Tile of the Week entry is a basic crossroad linking 10-foot corridors to a larger 20-foot hallway. 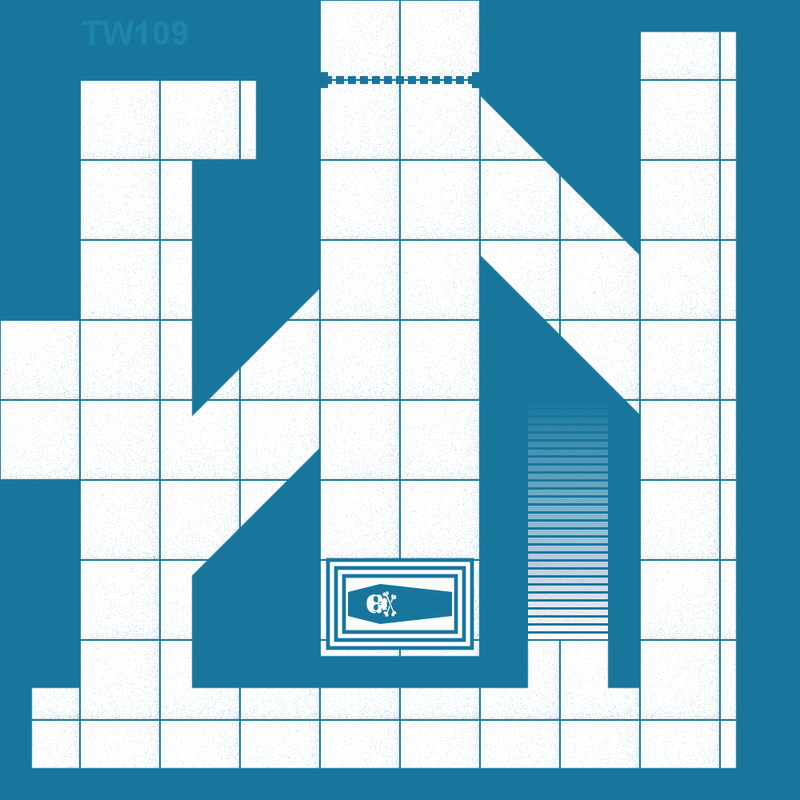 I haven't done a Tile of the Week entry in eons, so I thought it was time to add to the collection. This tile is a standard geomorph with some symmetry. I think it looks like a grand entryway of some sort. 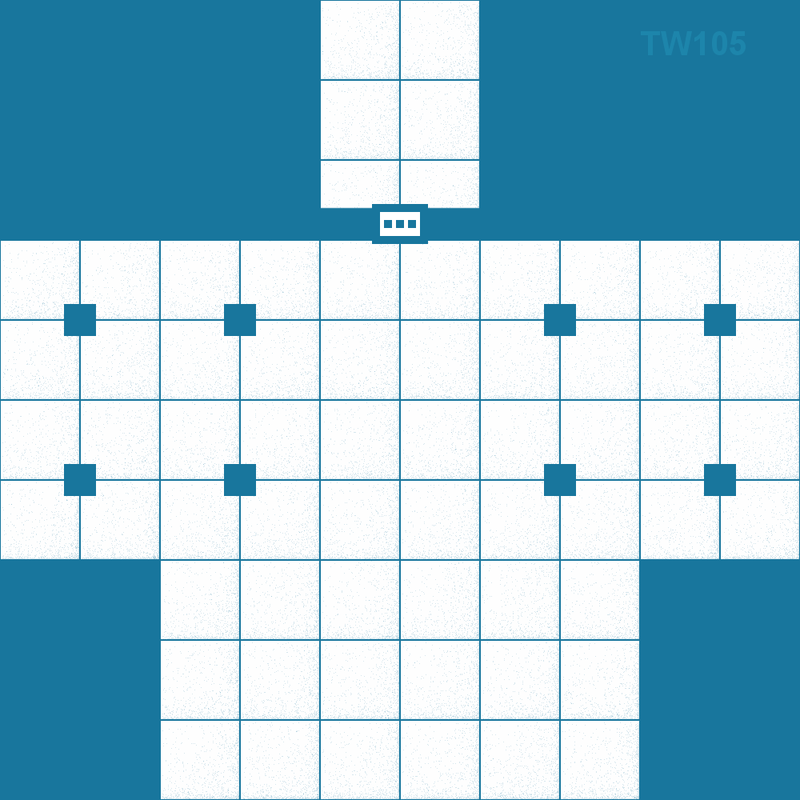 One hundred tiles. That can't be right, can it? I guess so. 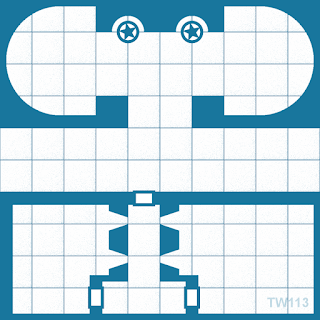 Here's the latest Tile of the Week geomorph. It's a four-way intersection with a built-in elevation change. With 100 tiles in this set, I'm going to take a break from new tiles, at least for a while. 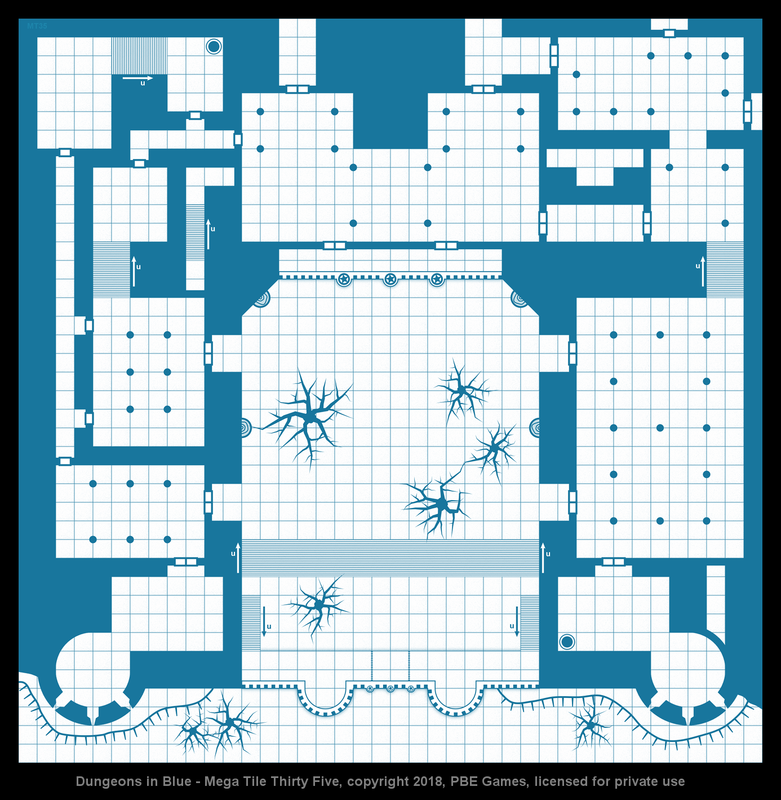 Here is today's Tile of the Week entry, a corridor corner and pillared chamber with a fountain and two staircases. 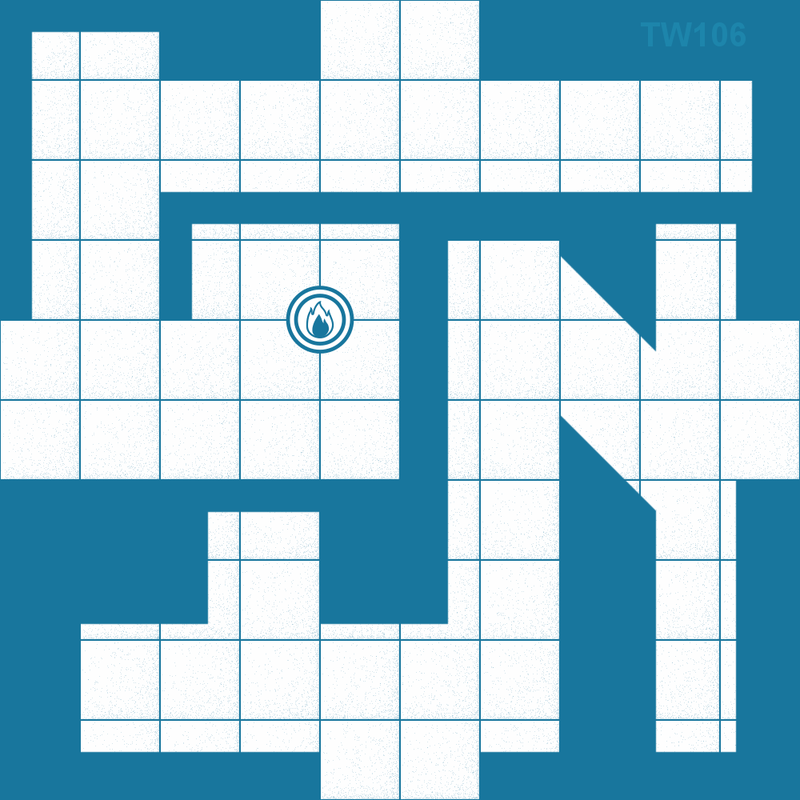 This week's Tile of the Week entry is a well-defended dungeon passage. 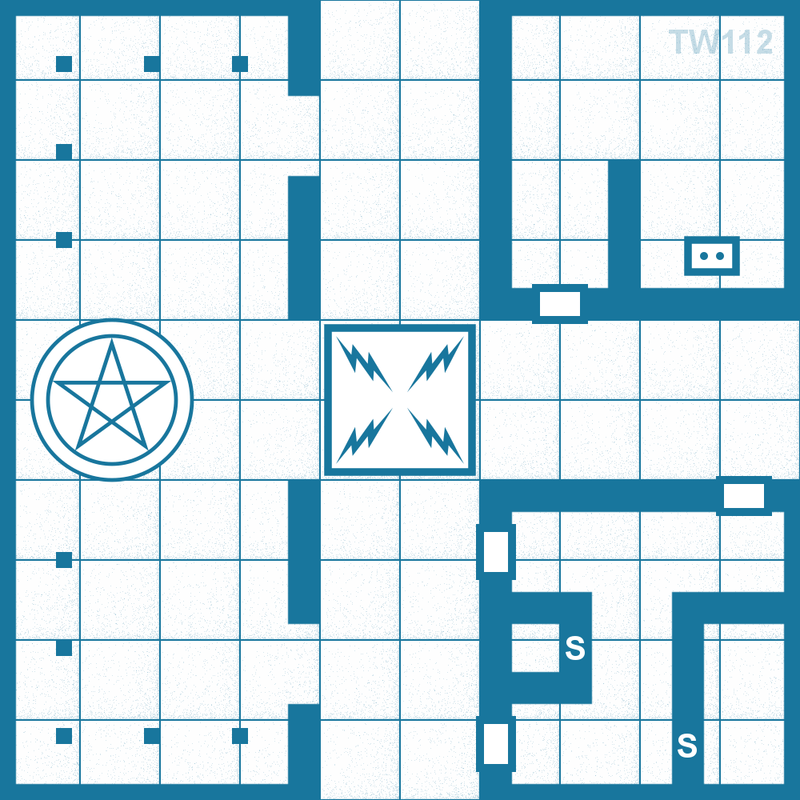 Plenty of arrow slits and a couple secrets make for tough going here. Here is today's Tile of the Week entry. 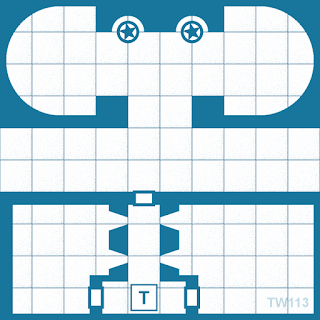 This is a simple four-way intersection with a pool in the center. A number of statues are scattered around the central chamber.